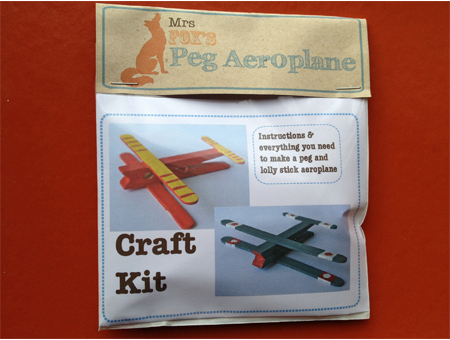 With this little kit you can make two peg and lolly stick aeroplanes, all you need add is paint and a crafty little fox. Simple instructions are included along with glue dots, although PVA or craft glue will work just as well. 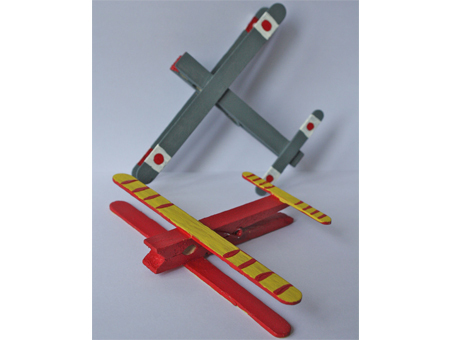 These are great stocking fillers or rainy day crafts for kids, even "big kids" can enjoy them. Mrs Fox always likes to use natural and re-cycled materials, even the little bag they come in is compostable. Mrs Fox's Crafty Boxes forJuly 2013 was themed around Flying things, this was one of the crafts, so we thought we should spread the love. Check out our blog to see what we got up to or CLICK HERE to find out how to join our exclusive little kid's craft club.